The purpose of this section is to give the reader a broad view of how prominence works over a well-defined geography. Different prominence cutoffs allow us to view terrain at different levels of granularity. This page looks at California at three very different scales. Firstly, California can be expressed as a set of nine "ultra-prominences" - the summits with 5,000' and greater prominence. Each mountain is the representative of a large area of mountainous terrain -- groups of summits that comprise a discreet topographic region. Secondly, California can be expressed as a set of 169 summits. This is the set of all summits with 2,000' and greater prominence. They are widely distributed across every physiographic region of the state. Lastly, we can examine the full dataset of summits for the state. 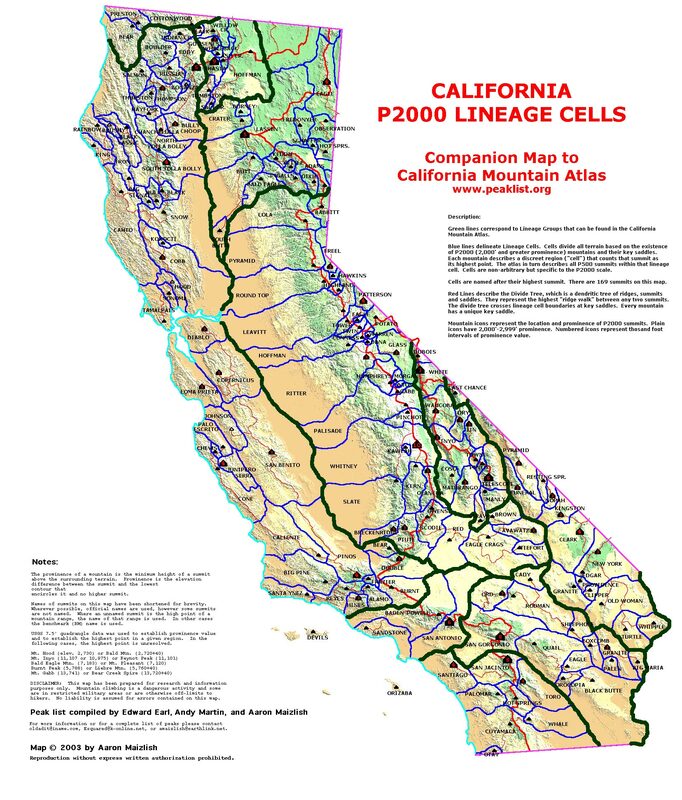 The California Mountain Atlas chronicles over 3,800 peaks in the state - organized in a logical hierarchy of lineage groups and cells. 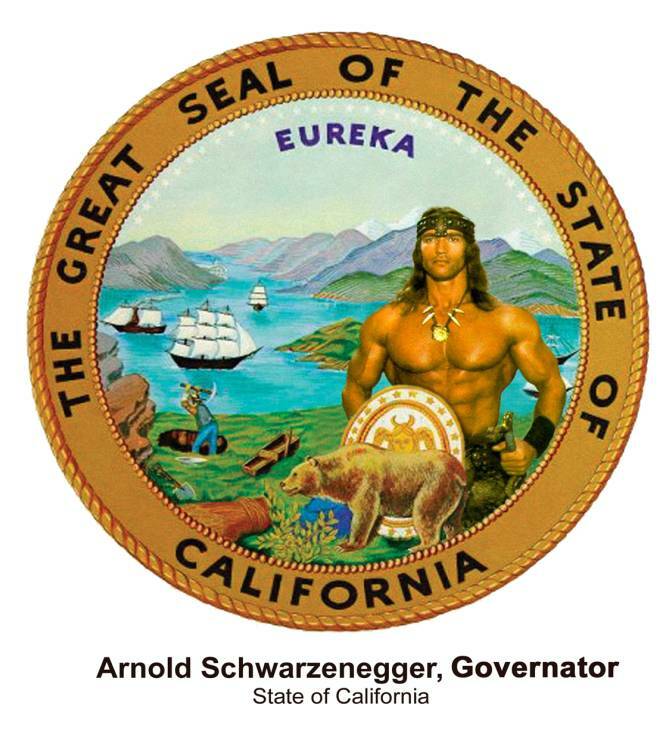 California has nine of the big boys: Summits that stand 5,000 feet above all else. Three are in the north of the state -- Mt. Eddy, Mt. Shasta and Mt. Lassen. Three are in the Southern California Transverse Ranges -- Mt. San Antonio, San Gorgonio Mtn., and San Jacinto Peak. The Sierra Nevada claims just one, its highpoint Mt. Whitney. The remaining two are in the high basin and range -- White Mountain Peak and Telescope Peak. It's a nice set to climb: Mt. Shasta is the most difficult, the rest are entirely non-technical. The Ultras form the basis for the organization of California's topography. Lineage Cells are formed by tracing channel lines (channels, pits, and basin saddles) from their key saddles to the oceans. (If the terminology is confusing, take the short course on prominence theory and orometry.) Basically this is analogous to tracing the watercourses from the low points between summits. I have added Mt. Piños to the map on the right (P4800) and in the California Mountain Atlas, because it forms a natural group of the Coastal Ranges that constitute a physiographic region distinct from the rest of the Whitney group. Names, elevations and prominence values on the peaklist are derived from printed USGS maps. All prominence values are based on USGS printed elevations, as with the rest of the United States. Note that elevation values on the USGS topographic maps are based on an earlier vertical datum, NAVD29 which is no longer in use. New sources of digital elevation data rely on NGVD88; based on a different methodology for measuring the geoid. The geoid is the theoretical shape of the earth where the specific gravity is held constant. NGVD88 is the basis for GPS elevations. The transition from NAVD29 to NGVD88 will result in higher elevations of most of America's mountains. In California this seems to mostly vary from 1-15 feet. For example, Mt. Whitney, previously 14,495' (although the topographic map says 14,491' in error), now measures 14,505' under the new datum. Richard Carey and Aaron Maizlish have both researched new elevation values for most of California's P2000 summits (those with NGS or USGS vertical control benchmarks.) In addition, surprisingly, investigation by Aaron Maizlish demonstrates that as many as 25% of the benchmarks are recorded as being originally placed anywhere from 1' to 20' below the true natural summit of a peak. Thus, even under the old NAVD29 system, printed elevations were often under-reported on USGS maps. The maps indicated the elevation of the benchmark, not necssarily the highest natural point on the summit. The combination of these two error bounds will result in some surprising new elevation values, which should be considered more authoritive than widely publicized USGS map derived values. ** NEW ELEVATIONS** for California Summits -- this page is not on-line yet, in the meantime, you can see the NGVD88 values on Richard Carey's peakbagging.com website. The California Mountain Atlas is a complete listing of 3,800 summits of ≥P500 that span the entire state. The lists and maps give perhaps the clearest picture yet of the topographic properties of summits and divides over a wide and varied terrain. The atlas is organized around the principle of lineage groups and cells. This is a simple, non-arbitrary system for describing mountainous terrain, but it takes a little getting used to. Before you spend a lot of time with the data in this atlas, it may be helpful to take the short course on "Orometry" . It explains the principles and terminology governing such concepts as lineage cells and groups, divides, key saddles, basin saddles, and other topological functions of the terrain. The first level of organization in the Atlas is the division of California into eight physiographic regions, roughly based on the Ultras. The second level of organization is the division of the state into 163 orometric provinces - "Lineage Cells" - based on the P2000s. Each summit with more than 2,000 feet of prominence is assigned a conterminous area of terrain of which it is the highest point. All summits within the bounds count the P2000 in their lineage. The schematic map on the right illustrates how terrain is divided using lineage cell principles. Most of us are accustomed to grouping sets of mountains by their named mountain ranges. While this is handy for orientation, it is an insufficient means for categorizing the world's summits. A mountain range, like a mountain itself, is an object without a well-defined perimeter. In fact, a mountain range is part physiographical (a region of continuous uplift) part geomorphological (a region of common geologic formation and origin) and part socio-cultural (a region defined by its use value). Some smaller ranges are named, some are not. Some mountain ranges are discontinuous or bisected by rivers without gaining separate names. Foothills are sometimes included with a mountain range, sometimes separated. Lineage theory on the other hand is solely derived from elevation, and thus lends itself to well-defined borders. 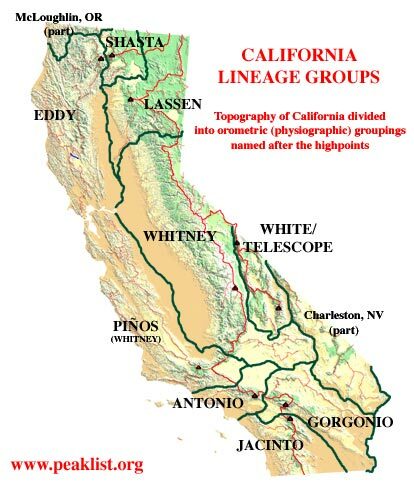 It so happens that the California lineage groups lend themselves to well-defined physiographic regions. For example, the Eddy Group includes all Coast Ranges south of the Klamath River and west of Interstate 5 south to San Francisco. The Pinos Group neatly includes all Coast Ranges south of San Francisco to Soledad Pass (north of Los Angeles) and the Tehachapi Mountains. The Southern California Transverse Ranges are neatly divided into three groups separated by two low passes, Cajon Pass (I-15) and San Gorgonio Pass (I-10). The Lassen Group is separated from the Whitney Group at Beckwourth Pass near the Sierra Valley. 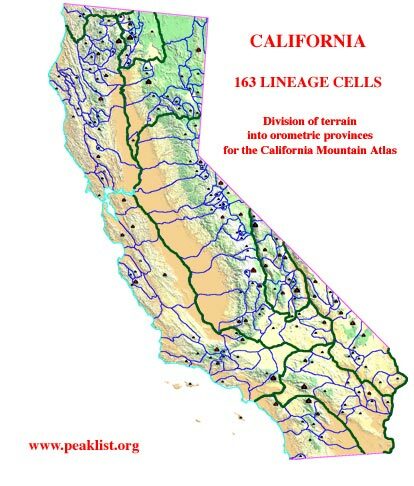 Thus California's natural mountain ranges neatly fit into lineage-derived groups. On the other hand, the Mojave Desert is apportioned into five separate groups. As it is not a region of continuous uplift, the desert ranges are divided by the imaginary drainages that would flow if the region were well-watered. As the California Mountain Atlas goes on-line I will be posting some special sections on this page, including some lists for the Sierra.